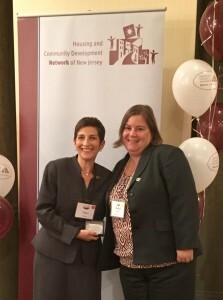 The Housing and Community Development Network of New Jersey has honored NewBridge Services with the Lasting Achievement Award. “We want to be sure to celebrate your success and honor your tireless efforts to improve the lives of the people you serve,’’ HCDNNJ President and CEO Staci A. Berger wrote to NewBridge in a letter announcing the award. NewBridge Chief Real Estate Officer Melody Federico accepted the award on Oct. 20 at the network’s 2015 Community Development Conference & Annual Meeting at The National Conference Center in East Windsor. The HCDNNJ is the statewide association of more than 250 affordable housing and community development corporations, individuals and other organizations that support the creation of affordable homes, economic opportunities, and strong communities.